terrace, gazebo, walkways, awnings and malls. It could be used for BBQ, wedding and banquets, which provides warm soft lights. UL listed commercial lighting with flexible heavy-duty cord withstands the wear of everyday use. Insulation material allows it weatherproof, protected from hot and cold temperatures, wet weather, wind and etc. On the back of each sockets has a hanging hook, makes easy installation with zip ties, cup hooks, or guide wire, then plug in and play. Our End-to-end connection can link up to 3 strands string lights. Long enough for DIY decoration. We recommend you could install the empty string light without bulbs, then re-install the bulbs. When connecting one with another, please make sure the power off, and push hard to tighten the connector. [DIMMER COMPATIBLE TO SET THE RIGHT MOOD]:For greater mood lighting flexibility and a soft glow, a dimmer switch to create the perfect atmosphere for a birthday party, family reunion, , or wedding reception. It adds flair to bistro deck porch patio garden backyard terrace pergola café restaurant malls for wedding BBQ party banquets, also suitable for tree-lighting like Christmas tree. 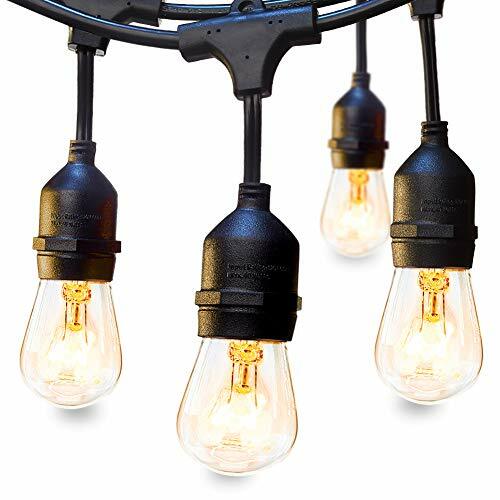 [IDEAL OUTDOOR LIGHTING] Each strand contains 15 E26 based hanging sockets, provided with 18 pack of 11W S14 incandescent bulbs (included 3 extra bulbs). The distance between bulbs is approximately 3.85FT. This Heavy-duty light is bright enough and ideal illumination anywhere. [SMART INSTALLATION] Each socket has hanging hook above, makes it easy for hanging with hooks, guide wires, or zip ties. It can connect with another simply use grounded cord plugs into any standard outlets. Link up to 5 strands. [SATISFACTION WARRANTY] Your satisfaction is first. If you are not fully satisfied for any reason, please contact us.